498 Broome Street. Image credit: Umberto Squarcia Designs, Inc.
Special permit will allow a vacant mixed-use building in SoHo to convert to residential use. 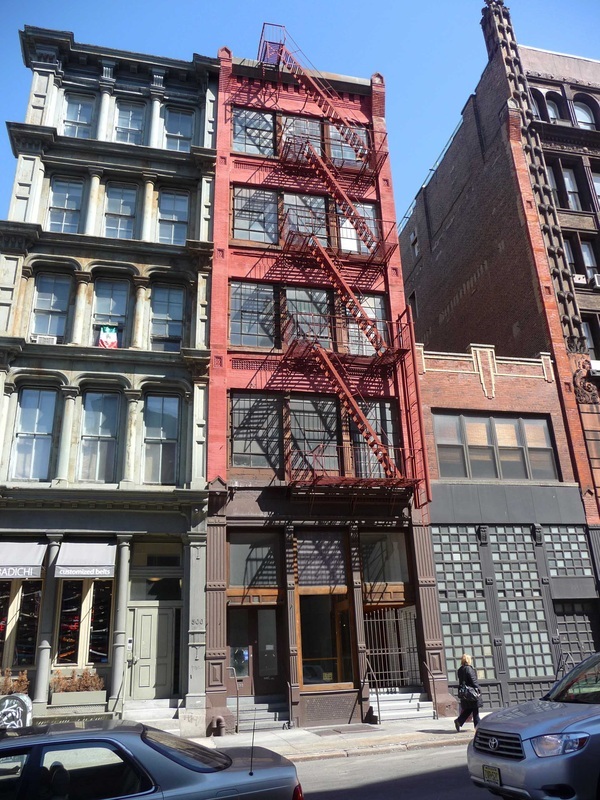 On February 4, 2015 the City Planning Commission voted to grant a special permit to Goose Mountain NYC, LLC to develop a six-story building at 498 Broome Street in the SoHo Cast Iron Historic District of Manhattan as a residential property. The permit would allow Use Group 2 residential uses on portions of the ground floor, as well as the second through fifth floors and the penthouse. The building has been vacant for three years, but previously housed Use Group 6 retail in the ground floor and cellar and an artist’s studio on the upper floors, though not officially designated Joint Live-Work Quarters for Artists. On August 20, 2012 the Landmarks Preservation Commission issued a Certificate of Appropriateness for the conversion as part of an agreement entered into with Goose Mountain to continually maintain the architectural and historic character of the building. On November 20, 2014 Manhattan Community Board 2 voted unanimously to recommend approval of the permit on condition that the proposal was modified to retain at least one JLWQA unit. On December 22, 2014 Manhattan Borough President Gale Brewer issued a conditional approval repeating the conditions of CB 2 as well as requesting clarification of Landmarks’ requirements for the buildings’ exterior materials. On January 7, 2015 the Commission held a public hearing on the application. Fredrick A. Becker, counsel for Goose Mountain, testified the building had been vacant for the past three years and had even though the prior owner was an artist, he was not certified with the city and the building had never housed any official JLWQA units. James Caras appeared on behalf of Borough President Brewer to read her statement of conditional approval into the record. On February 4, 2015 the Commission approved the special permit for Use Group 2 conversion. In its final report, the Commission recognized the building’s extended vacancy and that conversion would not displace any JLWQA units as the building never held such units to begin with. The Commission did repeat its caution that the approval should not be taken as a sign of abandoning SoHo’s zoning framework, writing special permits “cannot be a vehicle by which live-work spaces that contribute to the rich mixed-use character of SoHo are irrevocably converted to residential use.” The Commission also called for additional attention to the zoning in SoHo and NoHo’s M1-5A and M1-5B districts, citing affordability and preservation concerns raised by both CB 2 and the Borough President, and the need to accurately identify existing JLWQA tenants as the neighborhood continues to change. The application is scheduled to go before the City Council Subcommittee on Zoning and Franchises on March 9, 2015. CPC: 498 Broome Street (130066-ZSM) (Feb. 4, 2015). The previous use/uses of an historic building is/are of much less importance than keeping the building relatively intact in its original architectural finery. Nothing is immutable and, as times change, how to modify and preserve Historic buildings must really must accommodate that basic premise. As Soho has the greatest number of cast iron buildings in the world then the urban values of the area must also be considered as they are of equal (perhaps of even greater) importance to the architectural values of individual buildings. A very wise and prudent decision by the Committee. However, for those of us in Europe, it would be good to know what JLWQA stands for? JLWQA stands for “Joint Live-Work Quarters for Artists”, a designation created in 1971 to legalize artists’ then-illegal conversion of SoHo’s vacant cast-iron manufacturing buildings and warehouses into lofts and studios, provided they were certified as professional artists with the City.